Holistic nutrition includes consciously eating healthy foods that promote vibrant physical and mental health, while supporting a strong immune system and preventing disease. Healthy food and nutrient supplementation (nutraceuticals) can also be used as medicine to control or reverse most health issues. If you haven't already read and implemented the information in the Drink Pure Water, Healthy Colon, and Holistic Detoxification sections of this website, please do that before or while starting any major changes in your eating habits. Living the principles of holistic nutrition will make a huge difference in how food is assimilated and utilized by your body. Though there isn't a specific diet that will accommodate all people, there are certain basic Holistic Nutrition Guidelines to use when choosing the food you eat and the way you prepare it. Drink adequate amounts of purified water - at least eight 8-ounce glasses daily. Even mild dehydration will interfere with the digestive process and aggravate several symptoms and diseases. Choose organic food as much as possible to avoid pesticides, herbicides, genetically modified (GMO) foods, and irradiated food. Fresh organically grown food has more nutrient value and tastes better, and organic meats and dairy don't contain hormones and antibiotics. Select whole grains when buying foods such as bread, pasta, rice, tortillas, and cereal. Whole grains provide more nutrients and fiber. About 22 natural nutrients are processed out of grains in the making of refined flour products. 'Enriched' is a misnomer since only 6 or 8 synthetic nutrients are actually returned after processing. Try to buy locally grown fresh fruits and vegetables. Sometimes it's better to eat freshly harvested local produce that isn't certified organic, rather than organic produce that was harvested before ripening and transported thousands of miles to the grocery store. 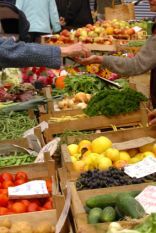 If you can't grow your own produce, find a Farmers' Market in your area, or ask your grocer to offer local produce. Essential fatty acids are necessary for good health, so eat plenty of good fats. The low-fat craze was based on faulty research and caused a decline in health over decades. Use organic cold-pressed oil such as extra virgin olive oil for salads. Cooking requires an oil that can be heated without being denatured, such as coconut oil. Flax seed oil is a great addition to a breakfast smoothie. Eat raw and minimally processed whole living food as much as possible. Foods in their natural state contain more nutrients and active enzymes. Eat a variety of nutrient-rich healthy foods. There is no single food that provides the more than 40 different nutrients we need for good health. Experiment with different foods and recipes. Eliminate refined sugar, high fructose corn syrup, and artificial sweeteners such as aspartame (NutraSweet, Equal) and sucralose (Splenda). All contribute significantly to serious health problems. Salt: Limit sodium to less than 2,300 mg per day - equivalent to about one teaspoon of salt. Check food labels; you'll be amazed how much sodium is added to processed foods. Substitute regular table salt for something healthier, like sea salt or Himalayan salt. Coffee and sodas - non-foods that have many destructive physiological consequences which cause several illnesses and chronic disease. Don't microwave food or beverages. Use a toaster oven, double boiler, tea kettle, or other appliance to heat or cook food. Genetically modified (GMO) foods: Unfortunately, it's not required that the consumer be notified about the presence of GMO foods. Most canola and soy is GMO, so never buy non-organic canola oil or non-organic soy products like soy milk, tofu, or soy protein powder. Use natural plant-based digestive enzymes to enhance your digestion. Enzymes will also reduce the formation of certain digestive by-products that can lead to intestinal toxicity and autointoxication. Our ability to produce enzymes decreases as we get older, and cooking and processing destroys the enzymes that were originally part of the food. Use a high quality daily multi-nutrient to supplement your healthy food choices. Even most organic produce doesn't have the same nutritional value that foods had several decades ago. Modern agricultural and food distribution practices and compromised soil, air, and water quality have degraded the nutritional content of food. Today we would have to eat much larger portions to get sufficient nutrients from our food. If changing to a healthier eating lifestyle is a major shift for you, make gradual changes. Developing new eating habits can feel overwhelming and confusing, and that may interfere with your success in making permanent changes. You can start with substitution. For instance, if you love hamburgers, stop buying the fast food junk and make your own. Buy organic or free-range ground meat, or organic vegi-burger patties. Use whole grain buns, and organic lettuce, cucumber and tomato. Try different condiments - like pesto thinned with olive oil instead of using mayonnaise. Clean out your kitchen pantry and refrigerator to get rid of unhealthy foods. Read the label ingredients to help decide what to toss or give away. Eat moderate portions; remember that a serving of meat is 3 ounces - about the size of a deck of cards. A serving of pasta is about a half cup. We've become used to super-sized portions, but we're turning into a nation of sick super-sized people. Start out the day with a nutritious breakfast. A smoothie with almond milk, fruit, coconut or flaxseed oil, protein powder and fiber is delicious and will jump start your metabolism and provide a lasting energy boost. Try to confine your eating window to 6 to 8 hours, which enables a fasting period of 16 to 18 hours. This allows your body a better chance to clean out cell debris and regenerate without having to expend more energy on digestion. Treat yourself! A healthy diet doesn't have to deprive you of the foods you love. Experiment with healthy substitutes and use moderation. I love my chocolate, but I've learned to eat it in moderation and limit it to organic dark varieties. with vibrant health, stamina, and a clear mind. Nutritional Value of Fruits and Vegetables Fruits and vegetables are nutrient-rich foods that will help you avoid many chronic diseases. Eat five to thirteen servings daily. Whole Grains Are Rich In Fiber, Vitamins, Minerals, and Phytonutrients How do we identify true whole grain products and what are the health benefits of eating whole grains? Dangers of Soy Foods ~ Or Should It Be... The Health Benefits of Soy? This has been the subject of a huge debate in the nutrition community for many years. Both sides of the controversy have strong arguments to support their positions. Use a Slow Cooker Crockpot To Prepare Delicious Nutritious Food There are many benefits to using a slow cooker. The crock pot cooking appliance is a time saving way to get a hot, nutritious meal on the table with minimal effort.